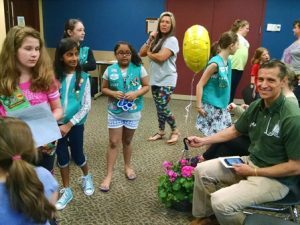 The Hillsborough Girl Scout Troop 60527 recently organized a project called “Paws for a Cause” to gain their Bronze Award status. 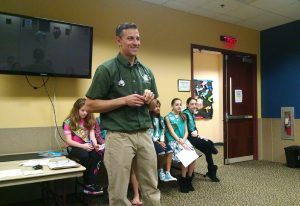 They invited Joe Martins, DVM, to make an address on responsible pet care as part of the project. 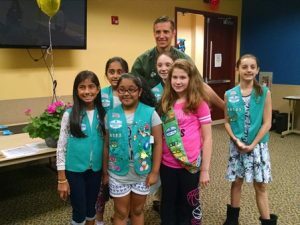 The program took place at the Hillsborough Library on May 6, 2017. 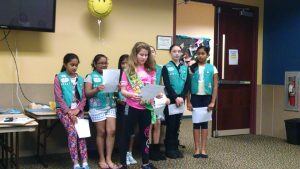 Each of the seven girls gave a verbal presentation on responsible pet care. Topics covered included how owning a pet can be a wonderful experience; the value of adopting a rescued pet from a shelter; how to take care of the pet and the responsibility pet ownership brings; the description of a “high-kill shelter,” and the importance of spaying and neutering pets. Dr. Martins congratulated the girls on a job well done and began his presentation with the basics of what pets require in addition to food, shelter and love. It’s important to establish a routine with our pets and recognize the importance of training and learning to read your pet’s body language as a form of communication. When visiting shelter pets, one must realize the cats and dogs may be very frightened and feeling stressed by folks coming by to look at them and even trying to touch them. It can be very scary to the animal. A shelter is a good place to learn to recognize a pet’s body language. Is the pet at the back of the cage and trying to sleep? Or is the pet advancing toward you in a friendly manner wanting to interact? The best thing to do is view the pet from a distance first. Take your time and don’t stare at them. If they appear friendly, try throwing them a treat before you interact. Do not invade their personal space too soon. You have to respect their personal space and remember the pet may simply be scared. Dr. Martins also touched on the subject of spaying and neutering pets. There simply are not enough loving homes to take in all the unwanted puppies and kittens for lack of spaying and neutering, and the pets often end up in shelters, many being high-kill shelters. Therefore, the decision to spay or neuter a pet is considered part of responsible pet ownership. Another reason pets end up in shelters is because of behavioral issues. Dr. Martins described how sometimes dog owners inadvertently reward a behavior before the positive task is completed. Therefore the dog associates a task that might not be the intended outcome the owner was trying to accomplish with the pet. Sometimes different family members reward the pet for different behaviors, further confusing the training process. Therefore, Dr. Martins recommends practicing training daily with everyone in the household on the same page. He suggests dogs be taught the foundation skills of sit, stay, and down. Also important to know is when to reward, how to reward and when not to reward. “I have a lot of folks who come into the animal hospital and tell me ‘they have always done it this way, but with this dog, it doesn’t work.’ Therefore I give people three free wishes with regard to their pet’s behavior because we can fix their behavior. We discuss it, we go over things they are doing wrong, then we come up with a plan,” said Dr. Martins. Dr. Martins continued on the topic of pet body language and how to react as well as how not to react using the example of a stranger’s dog running toward you in a dog park. He recommends not making eye contact, remaining silent, turning to the side and “acting like a tree” – stay still and let the dog approach. The dog most likely will sniff and walk away leaving you unharmed. Dr. Martins took questions at the end of his presentation. Questions ranged from pet behavior of dogs and cats, feeding issues, diet control, wet versus dry food, home cooking for pets, kitty litter box maintenance, and human pet allergies. This entry was posted in Events, News and tagged Cats, Dogs, Events. Bookmark the permalink. ← Happy World Rat Day!